RITA: Good day, Nadine! Thank you so much for giving me this opportunity. Let’s start by exploring how you first became interested in promoting positive discipline for children, particularly in advocating for an end to physical punishment? NADINE: My journey to promoting positive discipline for children was a long one. It really began with the education I had in training to be a school psychologist. One cannot study learning and behavior without becoming opposed to physical punishment of children. It is harmful and ineffective in the long term. My eye-opening experience was observing a school paddling. I was a school psychologist called in to the principal’s office to witness a school paddling in a Columbus, Ohio [USA] suburb in 1981. I was shocked. I had never seen children being hit with instruments – not in my home or my one-room rural school in Wisconsin [USA]. I was familiar with spanking. In the l960s, I had three little boys, all under five years old at one time, who I spanked a few times reflexively and in frustration when they were toddlers. I didn’t like it. I read Baby and Child Care by Dr. Benjamin Spock to help me raise our boys. At that time, Dr. Spock said a little spanking was OK. The public firmly approved. Ninety-five percent of adults in a national survey said that sometimes children need a good hard spanking. Later, Dr. Spock said that he had traveled to countries where children were seldom hit and they were growing up healthier than our children. He was on our EPOCH-USA Advisory Board when he died in 1998. He changed his mind about spanking, and so did I. The public is changing, too. Now, about 50 percent of adults respond affirmatively to the statement that children sometimes need a good hard spanking. RITA: What led you and Bob Fathman to found the Center for Effective Discipline (CED)? NADINE: We wanted to end school corporal punishment in Ohio. I learned that many children who were paddled ended up injured and needing medical care. Bob’s first-grade daughter was paddled in her suburban school for circling instead of underlining on a school paper. Physicians at Columbus Children’s Hospital (now Nationwide Children’s Hospital) were upset because they couldn’t find a way to deal legally with school padding injuries. They had a protocol for dealing with the same kind of injuries parents might inflict but educators were protected by law. Ohio was one of only three states that did not allow school districts to ban corporal punishment. We decided we would end corporal punishment in Ohio schools. I was asked to lead the ban effort in Ohio and to establish the Center for the purpose of informing the public about the effects of corporal punishment and alternatives. Bob served as the president all of those years. I was the executive director from 1987 to 2010 when we merged CED into the National Child Protection Training Center. RITA: Can you share some of the CED’s accomplishments? NADINE: We got four bills passed restricting corporal punishment in Ohio public schools, culminating with a complete ban in 2009. Ohio became the 30th [USA] state to ban school corporal punishment. We established www.stophitting.org to provide information about effects of corporal punishment and alternatives to its use. In 1998, we established SpankOut Day April 30th, which brings attention to the need to end physical punishment of children and to promote nonviolent discipline. We have given more than 600 small grants to nonprofit organizations, churches, and schools to hold informational events on effects of physical punishment and alternatives on SpankOut Day. RITA: What is the CED’s vision going forward? NADINE: The Center for Effective Discipline is going forward to bring attention to the need to end physical punishment of children and to promote nonviolent discipline. As part of a broad-based organization, the National Child Protection Training Center (NCPTC), we have an opportunity to spread our work to a larger audience. NCPTC has training programs that reach college and university training, law schools, religious organizations, and law enforcement groups. RITA: Tell us more about SpankOut Day and what parents and professionals are doing to bring awareness to the need to end physical punishment of children? NADINE: Modeled after the Great American SmokeOut, we ask those who still use physical punishment on children to seek out programs in their communities and information sites like Attachment Parenting International to learn more about alternatives to hitting children. Organizations can seek grants for informational programs, which are available annually. The brief one-page request for grants is posted October 15 of each year on www.stophitting.org for the upcoming year. 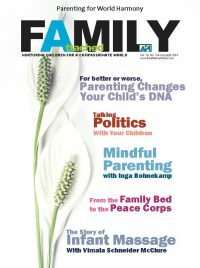 Parents and professionals can share information on positive discipline with others – books, pamphlets, and on websites such as Attachment Parenting International [API] and CED. When parents have finished reading our book about children’s words and images on spanking, This Hurts Me More than It Hurts You, they should give the book to libraries and professionals who deal with children – doctors, social workers, and mental health professionals to use in working with families. SpankOut Day April 30th is a reminder to each of us that we should not use corporal punishment on children, that we should educate ourselves about alternatives, and that we should support efforts to legally end its use. RITA: There are still a number of schools in the United States that use corporal punishment. What needs to be done to abolish paddling in schools? NADINE: Nineteen states still permit corporal punishment. Almost a quarter of a million school children are paddled annually, many of them multiple times (U.S. Department of Education). Parents and professionals can check www.stophitting.org for information about states that permit corporal punishment and the laws in those states regulating its use. If corporal punishment is permitted, parents should read the school board policy, which is usually posted online on the school board’s website. If it allows parents to opt out of corporal punishment for their children, they should do so. If the policy doesn’t specifically permit that, parents should write a letter to the school district saying that they do not want their children to be paddled. While the school district may not have to honor that request, our experience is the educators will be more careful about paddling a child whose parents have written such a letter. Parents should keep copies of the letter. Many parents have gotten paddling banned in their school districts. On www.stophitting.org, we provide some advice about how to accomplish that. In states where school corporal punishment is permitted, coalitions of organizations need to seek bans in state legislatures. In Ohio, I put together a group of 50 organizations, which finally achieved a ban in 2009. Some states such as North Carolina and Florida already have coalitions working on such legislation. They invite the support of parents. CED is a source of information about legislative efforts parents can join. It is likely that some states may take decades to ban corporal punishment in schools. To hurry the process, a bill to ban corporal punishment in Congress is being sponsored by U.S. Representative Carolyn McCarthy (Democrat-New York). It would tie federal funding in education to corporal punishment bans. Rep. McCarthy says she will keep introducing a bill until it passes. RITA: What help can parents get to overcome the challenges of learning to change their discipline methods from corporal punishment to a positive model? NADINE: Most communities have programs that provide information and encouragement on positive parenting. Parents need to treat with caution parenting programs, sponsored by some churches, that teach hitting children, even babies, with implements. API and CED are good sources for information about effective nonviolent parenting programs and reading material that can help parents find alternatives to corporal punishment. Making a change from corporal punishment to positive discipline is difficult, especially with older children. Sitting down with older children and talking with them about what you are trying to accomplish can help move the process forward. Children usually want to help. Realizing you are not perfect and probably can’t make the change overnight will help you endure in your efforts. Apologizing to children for mistakes helps them see that you are trying to change. It gives them a model for what to do when they make mistakes. Giving older children a voice in establishing rules and consequences can prevent discipline problems that formerly might had led to corporal punishment. That not only works with teens but also with younger children. RITA: What led you to write the book, This Hurts Me More than It Hurts You? How do you hope it will benefit parents? 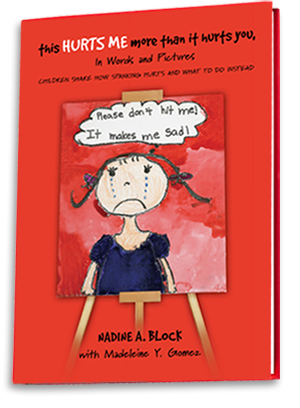 NADINE: The book validates children’s feelings and opinions about spanking and alternatives. Their voices on this important topic have previously been ignored except in a few professional journal articles, which are not viewed by the general public. So many times, spanking is seen as a rite of childhood, that it really doesn’t hurt that much, that it is part of tradition, and that it is needed to uphold the authority of adults. 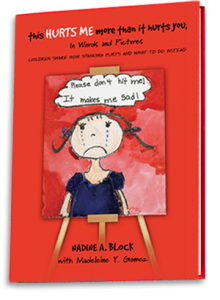 In this book, children send a strong message that spanking doesn’t do what parents want it to do, to change their behavior in the long term, and instead, it is painful and leads to feelings of anger, revenge, disappointment, and alienation from parents. I hope that it will motivate parents to move toward positive discipline of children. On the topic of nonviolent discipline alternatives, children in this book provide useful information about what works better than spanking. My experiences in changing attitudes and public policy on school corporal punishment have led me to believe that effective messages come in many forms. Few people are interested in reading journal reports about corporal punishment research showing that it is ineffective and harmful. Many people watch television programs like Dr. Phil and Oprah to get parenting advice. In working for the school paddling ban, I learned to carry photos of paddling injuries in the Ohio Legislature because some legislators ignored written reports about the harmfulness of corporal punishment. They could not deny photos. In this book, hearing children’s words and seeing their drawings is more powerful than reams of research, in showing the general public harm from spanking. RITA: Thank you, Nadine, for your time and wonderful work in strengthening families. And congratulations on your book receiving three awards from Royal Dragonfly Press (in Relationships, Interior Design, and Parenting) as well as getting all five-star reviews on Amazon.com. Is there anything else you’d like to share? NADINE: The book is being used by pediatricians and child abuse prevention personnel in hospitals to open discussions with parents and children about corporal punishment. It is also used in some pediatric resident and internship programs to sensitize students to the harm from corporal punishment to children. I am a father of three boys and a wonderful daughter. I find this article interesting because I thought in my eyes was ok in some circumstances. The older I get the more that Notice the trend in raising children. I do think that if shown how we all can have a better outcome in the way are lives are run from outside sources. Such as hate and fear. This can change the world as we know it.